A Flower Essence is a living energetic preparation made from the imprint of a plant’s vibrations in water. This potentized water is preserved with brandy and taken orally under the tongue or applied to the body. When ingested, the energy of the flower fills our energy field with its own signature vibration. Raising our vibration catalyzes safe, profound shifts in consciousness, allowing us to engage fully and authentically with the world around us. Flower Essence therapy pioneers a non-combative approach to health care. Rather than fighting a disease, they are evolutionary tools allowing us to resolve unhealthy tension in our thoughts, emotions and spiritual outlook which can be the cause of dissatisfaction and disease. Like a kinked hose, we may find that our natural joy, vitality, creativity, confidence or sense of purpose feels blocked. Infusing our systems with a living energy from Nature opens pathways so our personality and soul can work in partnership to create an authentic, fulfilling, meaningful life. 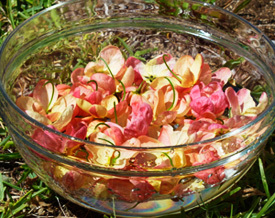 Flower Essences offer such a simple, safe, and effective modality to create a life well lived. No matter what our history or challenges, Nature has an essence to help us grow into who we are meant to be. Being our true self is the best gift we can give back to Nature in exchange for being alive. Discover how you can benefit from these gifts from Nature. For more information, check out our FAQs.